A lawsuit filed against the city of San Francisco today seeks to block the use of commuter shuttle buses at Municipal Railway bus stops, arguing that the practice is illegal and that the city’s plan to charge companies a fee for the use of the bus stops sidestepped state-mandated environmental analysis. A coalition of labor and housing activists including Service Employees International Union Local 1021 filed the suit over concerns that the shuttle buses are causing an influx of highly paid workers from the Silicon Valley area into the city, driving up rents and housing costs, the group said. In announcing the lawsuit today, the group said it names the city, Mayor Ed Lee, the Board of Supervisors, the San Francisco Municipal Transportation Agency and companies such as Google, Apple and Genentech as defendants. The lawsuit comes after opponents had filed an appeal of a pilot program by the SFMTA to charge companies providing private shuttle services $1 per stop for use of the city’s public bus stops. According to the SFMTA, more than 35,000 private shuttle boardings occur each day in San Francisco. As part of the program, which is set to go into effect July 1, the agency will allow the private shuttles to use about 200 selected bus stop locations around the city. The appeal sought an environmental impact report for the plan. The SFMTA board of directors had previously found that it was exempt from the requirements of the California Environmental Quality Act because the 18-month program was for fact-finding. The city’s Board of Supervisors denied the appeal by an 8-2 vote last month. In a statement today, the group called that an abuse of the board’s discretion and a CEQA violation. 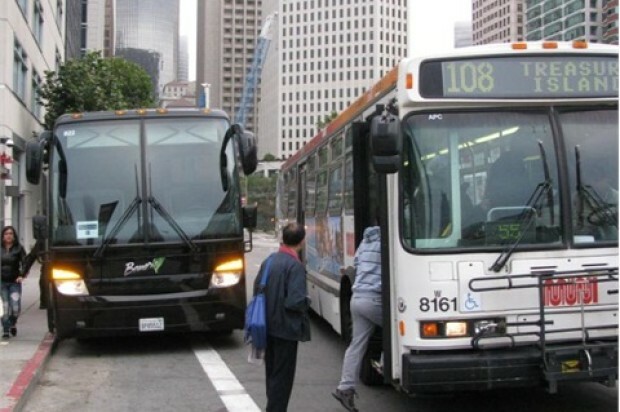 The group is also contending that the use of the bus stops is a violation of the California vehicle code, which allows only common carriers such as city and school buses to use the stops. Google, which according to the city sponsors about 57 shuttle buses per day in San Francisco, has previously said that the program saves more than 20,000 metric tons of carbon dioxide per year, the equivalent of taking about 4,000 cars off the road each day. Matt Dorsey, a spokesman for the San Francisco City Attorney’s Office, said this morning that he had not seen the complaint and could not yet comment on it.